Prevent ants from overtaking your hanging hummingbird feeders with these Wildlife Accessories Green Trap-It Ant Traps. 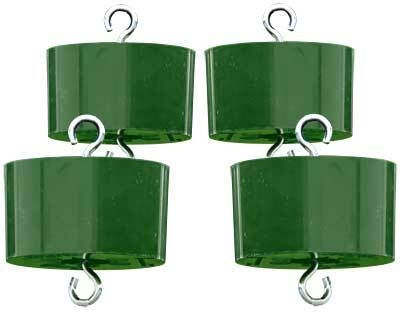 Each of these of 4, plastic vessels hangs directly above your existing hummingbird feeder, and holds 6 ounces of water. This creates a natural and chemical free barrier, as ants are hesitant to cross it, and thus stops them from reaching your nectar. The green color of each unit blends with your plants, and a metal hook at the top and base make hanging them simple. Conveniently protect your hummingbird feeders from crawling insects with these Green Trap-It Ant Traps. Made in the USA. Note: This case pack includes 4 of the Wildlife Accessories Trap-It Ant Traps, Green.